I'm not certain what it says about me that I enjoy repetitive activities. I delight at shooting arrows at coin-sized paper targets until I can no longer lift my bow. I know pure joy as a martial artist executing the same kick again and again. I smile endlessly at the track as I guide my tire to the same tiny patch of pavement on the same curve lap after lap. When engaged in such pursuits, I am truly and completely "in the moment." My brain may be busy with making my heart beat and my lungs expand, but consciously, it is engaged only with the task at hand. The release of an arrow, a roundhouse kick, or the guiding of my car into a 4-wheel drift engulf me as the rest of the world ceases to exist. And so it is with walking. The mindful endeavor of placing one foot in front of the other is exhilarating to me. Though, I admit, it is perhaps more to do with where my feet carry my mindful brain than the act of my feet themselves! 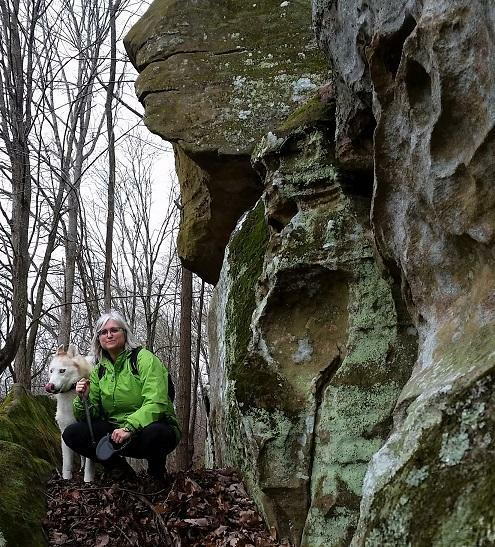 I hike the forests of Appalachia, above treeline in The Whites, over Alaskan tundra, through rain forests in the Pacific Northwest, across boulder fields in the Rockies, and in my beloved woodlands of Hocking Hills. When I do it "correctly," the rest of the world ceases to exist. It is the purest joy I know. And I know it best when my feet are falling in the paw prints of the dog walking in front of me. A moment shared with my dog settles deep in my memory and seems eternal. A moment unshared quickly fades into the ether and feels lost. And, herein, lies the harshest reality I've had to face about my own life: I lost years of living, years of what should have been precious time with my dog, because my feet were in one place but my mind was somewhere else. I adopted my first Siberian Husky when I was an athletic 26-year-old. My dog, Psy, was a powerful and brave soul who fancied himself a wolf! It was typical for us to hike 50 miles in a week. We crossed rivers, climbed mountains, trudged through deep snow, and splashed in the puddles of pouring rains. We were animals. During our time together, I met a man and fell in love. Unfortunately, it became a tumultuous relationship. As my heart was broken, a broken record played in my mind. I couldn't stop thinking about it. I thought about it even when Psy and I were hiking. One day, when I returned home from a hike with Psy, I realized I hadn't been with my dog at all. I had held his leash and followed in his path, but I hadn't been there for one second of it. And when I found the honesty to admit it to myself, I had not been present on our walks for years. It was a painful admission that years of precious time with my best friend were forever lost. It is still the greatest regret of my life. Since that time, I've had several dogs and a few boyfriends. I've had more broken hearts, but never another broken record playing in my brain. When I walk with my dog, I am with my dog. I am present. We are together. His paws fall one in front of the other, and my feet follow faithfully behind. I'm not sure exactly what he's thinking, but I have no doubt he is present in the moment. He is with me, in the universe, and I am with him, We are both seeing the trees and ferns, we are both hearing the birds and cicada, and we are both smelling the flowers and soil. We are both there. I learned to draw a bow with the repetitive precision of a machine. I learned to deliver a kick as if I were a programmed robot. I learned to hit the apex of a curve on every lap. Such acts taught my mind to be present. They taught me the utter joy of that simple thing. They taught me how to walk with my dog. It's a lesson I will not quickly forget again. The wasting of time is possibly the greatest regret each of us will have in our final moments of life. Moments lost to the ethos because we weren't paying attention is precious time wasted in our ridiculously short lives. I encourage everyone to walk. Walk the path of your life with a dog, a cat, or other beloved companion. And with each step, pull your wandering mind back to the moment. Look at your best friend beside you, smile, and realize that moment is time embedded in the memory of the universe. May it never be lost to thoughtlessness.